This year we commemorate the hundredth anniversary of the apparitions of Our Lady at Fatima, Portugal. The occasion is a time for reflection upon a world and Church in disarray. As a result, many sense that a dark future awaits us. The reason for this foreboding is that the message and requests of Our Lady have mostly gone unheeded. Our Lady warned of dire consequences for the world if men did not repent and stop sinning against God’s law. For those unfamiliar with the Fatima apparitions, the account of the event is simple. Our Lady appeared to three shepherd children tending their sheep near the village of Fatima. She asked them to come back for five consecutive months, on the thirteenth day, during which she would reveal to them an urgent message for our times. In the course of the apparitions, she continually asked for prayer, penance, and amendment of life. She predicted future events that would happen should men not convert. She also asked for the consecration of Russia to Her Immaculate Heart and the practice of the First Saturday devotion—in which the faithful are asked to confess, go to communion, say five decades of the Rosary, and keep Our Lady company by meditating for fifteen minutes on the mysteries of the rosary on the first Saturday of five consecutive months. On the day of the final apparition, Our Lady worked the most witnessed miracle in modern history as 70,000 people—including anti-Catholic reporters—saw the sun whirl in the sky on that cold and rainy day. In the one hundred years since these apparitions, everything has happened exactly as Our Lady said it would. The Fatima record is impressive in predicting both the past as well as the present. However, there are those who say the message is all behind us now. It’s over. It has been a hundred years, and thus the message is outdated and need no longer be observed. Nothing could be further from the truth. The Fatima Message is more urgent than ever. Here is why. Our Lady herself urgently called for the conversion of sinners back in 1917. She warned repeatedly that should her request not be heeded and men not convert, the world would suffer a great chastisement, including the annihilation of some nations. Looking at the state of the world one hundred years later, no one can affirm that the world has improved. The weakening of Faith is evident everywhere. The Church is in a shattered state of crisis. Society is coming apart because of abortion, the destruction of marriage and the collapse of morals. The world is full of social and political crises and military threats ready to explode at any moment. It is obvious that men have not converted. There is no doubt that Our Lady’s requests have not been heeded. And given the present state of world affairs, it is unlikely that men will do this in the near future. Therefore, Fatima is more urgent than ever because it foresees a chastisement for a world that has lost all sense of order. The message says what so many avoid saying: The present crisis is a moral crisis and, therefore, calls for a moral solution. A society without morals sets itself on the road to ruin. Many already sense this. They see the world and its institutions are coming apart. That within the family itself, there is much strife and discord. The horrific crimes of terrorism show that no place is safe from the evil in men’s hearts. Either we see a change of hearts, or this world is lost. And that is the great beauty of the Fatima message. Fatima is not only a message for those who heeded Our Lady’s requests. It speaks to those who did not heed them and come to repent. Fatima proposes a genuine change of heart. 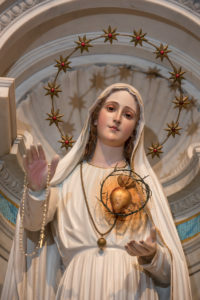 The message asks the faithful to have recourse to the Immaculate Heart of Mary, as a means to bring about a grand return to order in times of trial and chastisement. This recourse is the core of the unheeded Message. In this centennial year, we should resolve to make Fatima our compass. It is not over. The best part, her triumph, is yet to come. 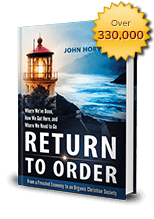 This entry was posted in Featured and tagged change of Heart, coming chastisement, coming triumph, Fatima apparitions, Fatima Centennial, First Saturday devotion, Immaculate Heart of Mary, Our Lady of Fatima, prophecy of Fatima by John Horvat II. Bookmark the permalink.